IntelNews is pleased to present a review of Gordon Thomas’ book Secret Wars: One Hundred Years of British Intelligence (St. Martin’s Press, 2009), a useful historical narrative of MI5 and MI6, the publication of which coincides with the centennial year of Britain’s intelligence and security services. The book’s strength rests on Thomas’ skilled storytelling, which, coupled with some interesting new information, will appeal to both popular enthusiasts and scholarly devotees of intelligence history. Please click here to read the review. 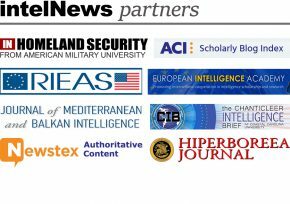 IntelNews is interested in reviewing both popular and academic publications on the politics of espionage and intelligence, intelligence history, analysis, terrorism and counterterrorism, as well as foreign policy, among other subjects. Authors, editors and publicists may contact intelNews for more information.